If you've never read the 'Outlander' series by Diana Gabaldon, then you're wrong. But you've got one heck of a treat in store, when you do finally find them. If you have delved into the adventures of Jamie and Claire, then you're probably as excited as I am right now. Just months away from the first airing of this epic saga airing on Cable TV, we're being driven into a frenzy by all of the teaser pictures, gossip and trailers. 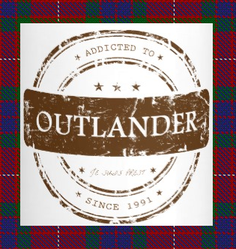 In the meanwhile, a new batch of 'Outlander' mugs have exploded onto Zazzle. Have a look at what's new; ready and waiting for you to take a sip, as you curl up to enjoy the first ever showing of 'Outlander' on Starz. I swear that none of these existed, when I wrote the previous run through of Outlander coffee mugs on Zazzle. That they've all appeared in just a few weeks demonstrates just how keenly anticipated this Cable TV Outlander adaption is amongst long time fans. But enough waffle from me, let's see what's new in Outlander mugs for Spring 2014. Beautiful printed Scottish thistle design by Outlander Art to begin. It's a classy gift for an Outlander fan. Nestling alongside is a coffee mug for Jamie Fraser fans - which will be everyone - sporting a lovely Celtic knot-work heart. Like all of the mugs here, they are microwave friendly and will hold their own in a dishwasher too. This Outlander Jamie Fraser mug has a legend with a whole new spin on whispering sweet nothings - or talking dirty, let's be honest now. Our favorite Highland chieftain certainly has a great turn of phrase. I remember well the moment when Outlander became more than just an enjoyable yarn for me, and leaped into the realms of greatness. It was when Jamie coyly confessed to Claire that he was a virgin, and did that matter to her? The resultant cute attack sealed that lad into my heart forever. These days, he only has to say Sassenach and I'm grinning like a loon. Please comment below with YOUR favorite Jamie sayings. Goosebumps! There are actual goosebumps here! When Sam Heughan comes in and speaks, there it is! The moment from a million dreams - Jamie saying 'Sassenach'! And while we're on the subject of Sassenach, here's a gorgeous blue Celtic Outlander mug proclaiming just that! Outlander is the only context in the world that could take the word Sassenach and turn it into a term of endearment. Sassenach technically means 'foreigner' in Scottish Gaelic, but in practice it's generally spat or hissed in the vicinity of the English. Highlanders have no reason to love their Southern neighbors, especially in Jamie Fraser's time and the ravages of Culloden. But all bets are off, when said Sassenach is Claire Beauchamp Randall. Of course, Sassenach isn't Jamie Fraser's only pet name for his Claire. Another one is mo doinne, which is the focus of this Outlander coffee mug. It literally translates from the Gaelic as 'my brown one', but that sounds a little weird in English. A better way of putting it, more in-keeping with the actual meaning, would be 'my beloved brown-haired one'. He uses it interchangeably with mo nighean donn, or 'my lassie with the brown hair'. 'Mo' being 'my' and 'donn' or 'doinne' as 'brown'. A great Outlander present or treat for any fan with brown hair. Or Claire. 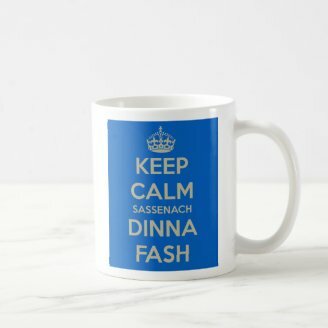 Nice play on the word 'Sassenach' in this lovely coffee mug for an Outlander fan. Let's face it, those of us who have been around for the duration are going to feel more than a little smug in summer 2014. When the first season of Outlander airs on Starz, and a massive influx of new fans are all running around wishing they'd been here twenty years ago too, we're going to feel like elder statesmen and women. Trend-setters. Decades ahead of the game. The People Who Already Knew About Jamie and Claire. Stake your claim with this Addicted to Outlander Since 1991 mug, or its variant Have an Outlander Addiction Since 1991 coffee mug. I'm not sure about the grammar on that latter, but it sure looks pretty! If you grab either of them now, you can enjoy several mugs of coffee - or tea made from whatever desperate ingredients Claire kept trying in A Breath of Snow and Ashes, if you're feeling adventurous and brave! By the time the first episode of Outlander appears on TV, you will have acquired a decent layer of tannin to prove that you were already fully aware of Jamie's charms and Claire's resourcefulness. You've been in this particular loop since 1991 and you have the mug to prove it. What kept the rest of you?! Or, as Jamie would say, 'dinna fash'. Great advice we can relay to all of those new fans jealous of our fandom longevity, or keep for ourselves! Slightly more subtle than your average Diana Gabaldon inspired Outlander mugs, these Craigh Na Dun coffee mugs will keep us dreaming with every hot, steamy sip. They will mean nothing to the uninitiated. Those who have never read the books will assume that we merely picked up a souvenir mug of Craigh Na Dun during a personal visit. Though, in all fairness, I think we've ALL visited Craigh Na Dun a million times, in our mind's eye. My imagination can definitely supply every detail. I've been there. I've followed Claire (and all the others) through the stones. I deserve a mug. You have no idea how much I am. And now that you're reading Outlander too, you know what I'm waffling on about!